Liver transplantation is the standard treatment for end-stage liver disease. Although immunosuppressive drugs, perioperative management, and surgical procedures and materials improvements, such as organ protection solutions, provide important support for the success of liver transplantation. However, there are still 3.8-5.8% of transplant failures such as liver failure after liver transplantation. Tissue ischemia-reperfusion injury caused by liver transplantation is considered to be an important risk factor in organ transplantation surgery and an important cause of graft failure. In addition, donor organs and preservation are also important influencing factors. Some donors whose age is too large, fatty liver and cardiac arrest are also used because of donor deficiency. The importance of ischemia-reperfusion injury in liver tissue damage has led to a large number of related studies. Unfortunately, the drugs and methods that have been shown to protect liver ischemia-reperfusion injury in many animal experiments have failed in clinical trials. Finding a better organ protection tool is still necessary. After the hydrogen biomedical effect was discovered, the application of hydrogen in the field of organ transplantation has also received great attention. 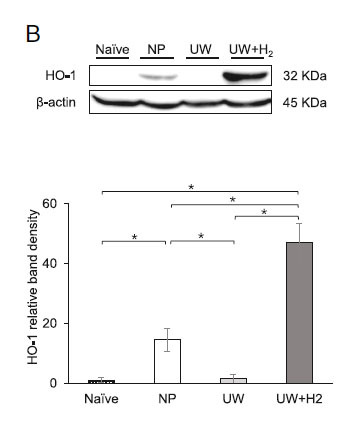 Because hydrogen is not toxic to the human body, it can produce anti-inflammatory and prevent ischemia-reperfusion injury through anti-oxidation. In the kidney, heart, skin, small intestine, lung and other transplantation models, it has been proved that hydrogen not only plays a role in the process of organ protection in vitro, but also has a long-term protective effect on the rejection of transplanted organs. However, there are relatively few studies on liver transplantation, which is worthy of study. The paper shows the technical methods of protective fluid and organ protection, which are easier to understand. The key point is that the dissolved hydrogen is a method of using electrolyzed water, and the hydrogen gas diffuses through the packaging bag to generate a protective effect, and the analysis shows that the hydrogen concentration can be maintained for a long time. The device also has a cryogenic device. 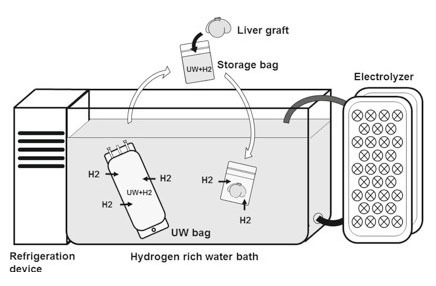 In February 2019, Keiichi Uto of the Kumamoto University Graduate School of Medicine published the protective effect of hydrogen organ protection solution on the liver in vitro in BMC Gastroenterology. This research uses a variety of research techniques to demonstrate that the dissolution of certain hydrogen in organ protection fluids improves the protective effect on the liver. Improve liver function after transplantation. The increase in heme oxygenase-1 content in liver tissue during this process may be the molecular basis for hydrogen production. The author of the research paper also includes Lin Zhong, a surgeon at Shanghai First People's Hospital affiliated to Shanghai Jiaotong University. Organ protection fluid is a relatively active direction in the field of hydrogen biomedical research. As early as 2008, hydrogen was used to treat small intestine injury after small bowel transplantation. Later, Chinese scholars carried out in vitro protection of heart, and Japanese scholars carried out heart kidney and extrapulmonary protection. Research. The protective fluid equipment introduced in this study was first seen in the patented technology of Japan Hydrogen Water Technology MIZ Corporation.